I read the newspaper while sipping a warm cup of coffee everyday. I turn on the tv before going to school every morning to see what's the latest information there is from favorite news channel. I walk through life every second of my life and feel the negative thoughts, the stressful complaints and the unenthusiastic approach of people to their surroundings and I can say (and perhaps, some of you, too) that I am totally tired of it. There some days when I try to avoid hearing and knowing what's the newest regarding information around the world since chances are I will just end up being fed with 90% of negativity (as always). Would not it be nice to wake up one day catching the kind of news which is positive enough to uplift your spirit or put a smile on your face or make you feel like there is still much hope left for a better tomorrow? 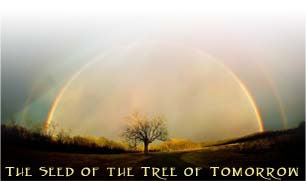 The Tree of Tomorrow Site is a place on the internet where you can find knowledge, wisdom, positive ideas and encouragement to help each and everyone of us survive in this cruel world. The site is a community of people (like you and me) meeting together to work hand in hand with the effort to attain a better world --- a happier and more harmonious future. Some individuals believe that it is already impossible to succeed in reach our goals of living in a more peaceful environment, a loving community and a society filled with the right reasons. But in unity, we all can make this world into a better place. I suggest you visit The Tree of Tomorrow Site and get to meet others who are willing to share a part of their principles and philosophy in making it possible to pave the way for a better planet for the entire humankind. If you are asking where I usually go these days whenever I try to get away from too much painful news, I turn to the Tree of Tomorrow page and feed my brain, my heart and my soul with wisdom and hope. Hope to see you there! nice site. thanks for sharing. we need something to uplift our spirits. it's true rossel.. thanks for dropping by and taking some time to go through my post. I agree that there needs to be something for people to gather around to make this a better world to live in. With all the hate and negative publicity that dominates in every country's market, this seems like the antidote for all that. Positive news is what we all need, and not the negative that changes our way of thinking as a whole. Recent blog:=- BWE Disclosed Magazine! hello blugging 'd! as always, you've dropped by and left a comment.. always the 'd way!